Ethiopian Christmas (Genna) is celebrated on 7th of January every year, instead of the typical December 25th, which is celebrated by Christians all over the world. This is due to the fact that Ethiopians use a four millennia old Calendar known as the Coptic or Ge’ez Calendar. Ethiopia has preserved numerous festivals, cultures, dates and beliefs from being influenced by external powers/invaders. Ethiopian Christmas or Genna holds a major significance within the Christian community for it is the day they received their saviour Lord Jesus Christ. 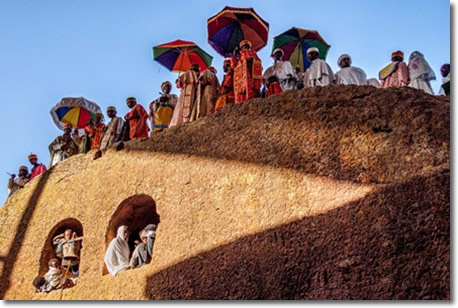 Ethiopian Orthodox Tewahedo Church marks this day as one of the holiest of its festivals after Easter. There is a 43 days period of fasting and prayer before the Festival. On the eve of Genna, which is the 6th, a midnight mass is gathered in churches all over the country. People give thanks to their savior Jesus Christ and most of all rejoice and celebrate his birth. The atmosphere within the churches and the sentiment of people holding traditional candles (made out of wax) combined with the sounds of hymns and Ethiopian Orthodox Mezmur are so harmonious and delightful. A three hour-long sermon consisting of prayer, reciting and singing concludes before breaking the fast.